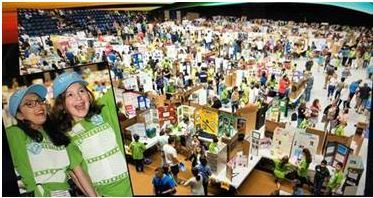 The 2018 Connecticut Invention Convention State Finals will take place on Saturday, April 28th on the Storrs Campus of the University of Connecticut at the Gampel Pavilion. NASA Connecticut Space Grant Consortium has been sponsoring this event for several years. The Invention Convention has pulled students from almost 300 schools across the state, with over 17,000 students starting the program earlier this academic year. Of these 17,000 students, 1,400 students attended regional events. You can follow the CT Invention Convention on Facebook @CTINVENTIONCONVENTION. The best time to view the inventions would be from 12:00-1:30, while the judges are deliberating and lunch is being served.